Crosby Senior is using Smore newsletters to spread the word online. We will assist public middle and high school students in Forsyth County in preparing themselves for successful college enrollment. We seek to ensure that every public school student in Forsyth County has the opportunity to attend college. 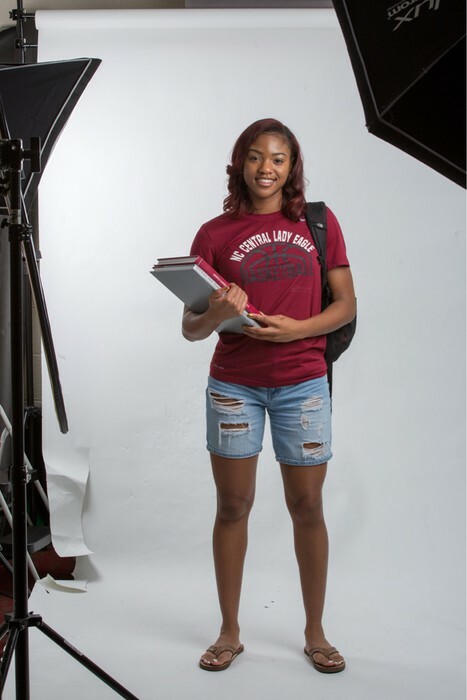 Dominique Adams, Crosby Scholar alumna is a junior student athlete at North Carolina Central University majoring in mass communications and minoring in business. She has advice for rising college students based on her own experiences. “College has been a great experience for me, but being a student athlete in college can be very challenging. My freshman year I had to learn to manage my time because athletes go to classes, practice, workouts, volunteer, attend mandatory functions and still maintain a certain GPA. Juggling all of that and trying to enjoy the college experience just like a non-student athlete with the parties and other events can be tough, but it can be done if you learn to manage your time your first year. Barbara Masi, director of college access celebrates her 20 year anniversary at the recent meeting of Crosby Scholars Board of Directors. She and her family continue to fund the annually awarded Harry Scofield Memorial Book Scholarship that is named in memory of her father. Her father was the first volunteer advisor that she recruited for Crosby Scholars. 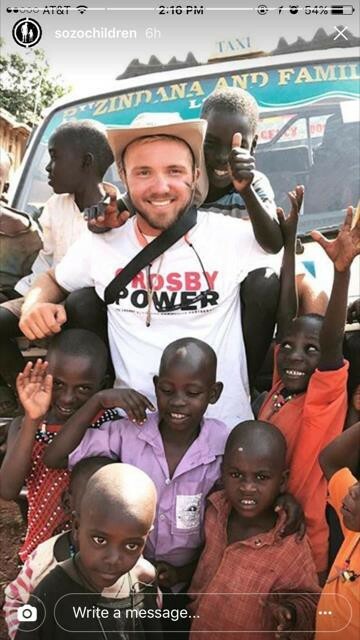 Each summer since the beginning of his high school career, Connor Groce has travelled to the country of Uganda to serve with a children’s organization called Sozo. 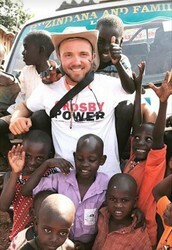 Sozo, meaning “to save”, meets the physical, spiritual and emotional needs of children in the Ugandan community who live in the orphanage and the surrounding village. Groce has developed relationships with many of the children by teaching, serving, and interacting with them. Sozo also raises money to help build additional facilities to further meet the needs of the community. Groce has made three trips to the African country and hopes to return this summer. Connor Groce is a senior Crosby Scholar at West Forsyth High School. Our annual fundraising campaign is underway. The money we raise will go directly to Last Dollar Grant scholarships for need-based aid that benefits seniors headed to college! In 2017 we awarded more than $750,000 in Last Dollar Grant Scholarships with amounts up to $1,200.00 for college-bound students. As our Program grows, we will send more students to college. Our goal with this program is to make sure that our scholars who want to attend college can by alleviating the gap between school aid and family contributions. 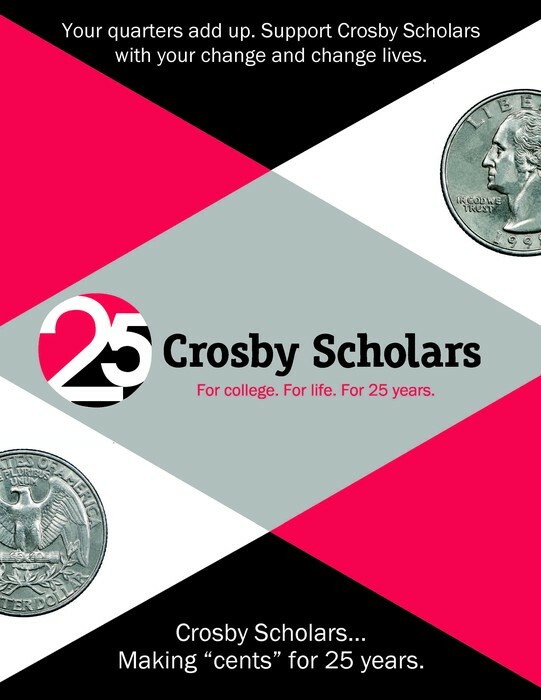 We invite you to contribute to our annual fund campaign by visiting our website at www.crosbyscholars.org and click the Donate Now button. 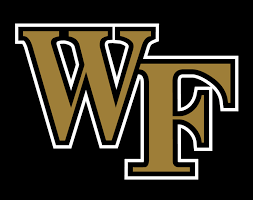 High school and middle school Crosby Scholars and their friends and families are invited to cheer on the Demon Deacons in the student section Saturday, November 25 at BB&T Field. Tickets for middle schoolers are FREE! Tickets for high schoolers and friends and family members of Crosby Scholars are only $10. To order tickets go to wakeforestsports.com/promo and enter WAKEFB17. Tickets are also available by calling Kurt Birkins at (336) 758-4034 or emailing him at birkinkd@wfu.edu. 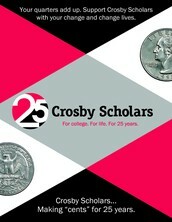 To celebrate Crosby Scholars’ 25th anniversary and to raise money for scholarships, we are leading a coin collection! The goal of the 25 Cents Campaign is to raise money from students to be matched by a corporate sponsor, so we can offer all high schools a scholarship. The goal is to provide two $250.00 scholarships at each high school, one for a senior and one for an underclassman. Student fundraising is being held at all high school and senior Academies through December. If you or someone you know is interested in being a matching sponsor, please contact Don Symons, director of finance and development at dsymons@crosbyscholars.org. 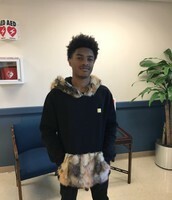 Students Connor Lessane and Reginald McNeil partnered to write a grant to the Winston-Salem Foundation’s Youth Grantmakers In Action (YGA) fund in hopes of receiving money for a service project. 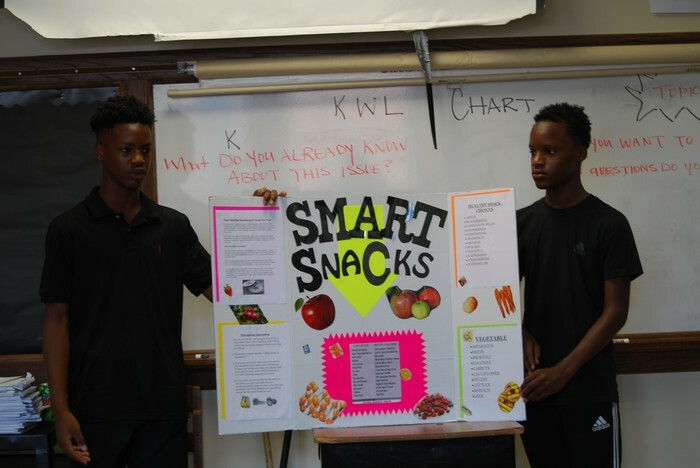 They received $350 to support their project at Grace Church Youth Worship Ministry Group to provide nutritional information to youth and encourage better eating habits! Youth Grantmakers in Action (YGA) of The Winston-Salem Foundation is an exciting opportunity for youth 15 to 18 years old from across our county. This youth-led group gathers to gain leadership experience, develop a greater understanding of the community and issues impacting local youth, represent youth in their community, voice their opinions and make grants to youth-directed projects in Forsyth County. Conner Lessane is an eighth grade Crosby Scholar at Meadowlark Middle School and Reginald McNeil is a senior Crosby Scholar at Atkins High School. 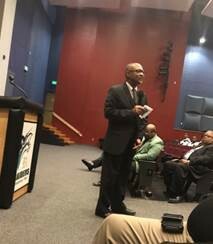 Bishop Sir Walter Mack Jr., his team of doctoral students, and Richard Watts with Crosby Scholars AAMPED program kicked-off the Young Black Male Achievers group (YBMA) at Reagan High School. More than 100 students signed-up for the program in its inaugural year. 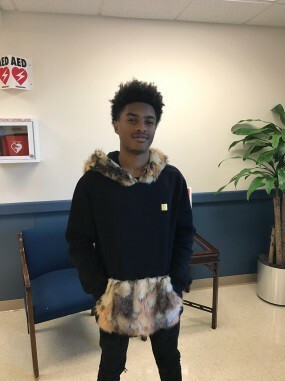 Crosby Scholars seniors have the opportunity to practice for their admissions and scholarship interviews by coming to our office for a mock interview. We highly encourage students to take advantage of this service because many students have never had an interview experience. Admissions interviews are a great way for colleges and universities to get to know applicants, so many of them offer interviews as an option during the admissions process. To manage the volume of interviews we expect to have this season, we are seeking volunteers to lead the mock interview process with our seniors. We only ask that volunteers have experience hosting an interview. 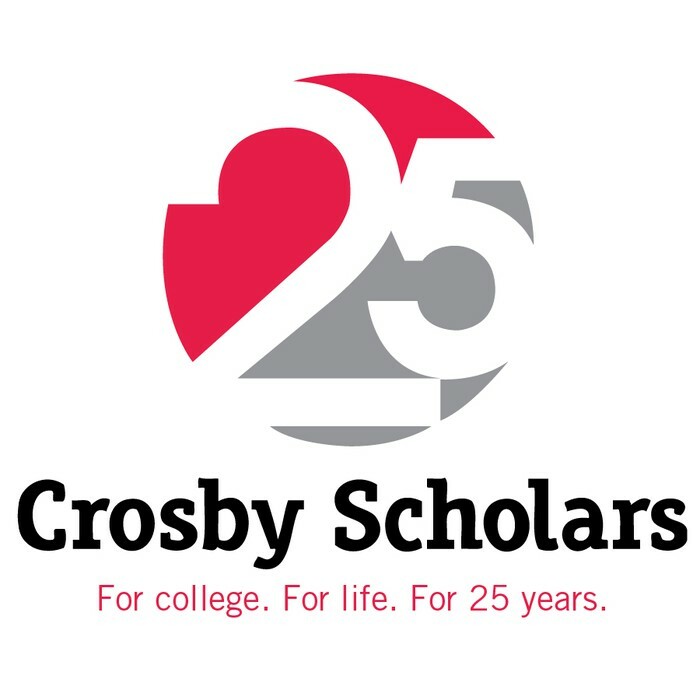 If you are interested in volunteering with Crosby Scholars as a mock interviewer, please contact Senior Program Coordinator Maggie DeBaugh at mdebaugh@crosbyscholars.org. 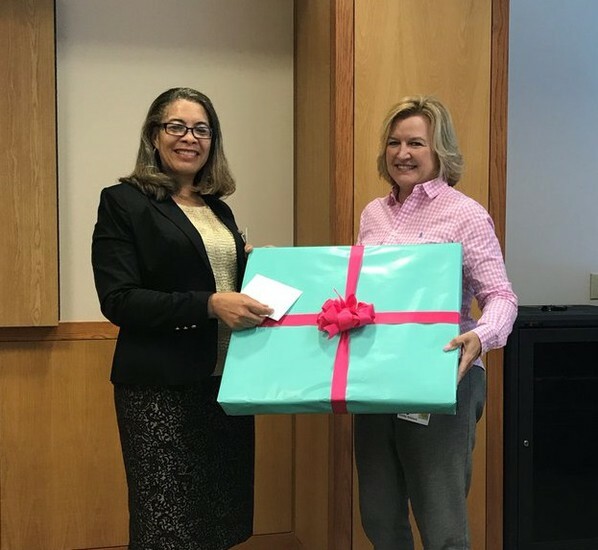 “They were outstanding,” said Oscar Santos, Crosby Scholars Board of Directors and Leadership and Professional Development Manager and Senior Vice-President at BB&T. 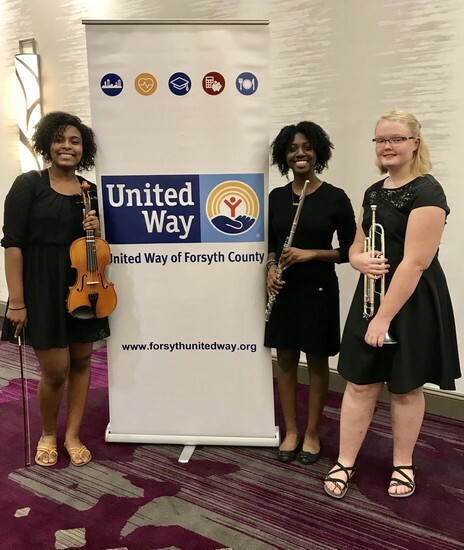 Three scholars performed instrumental music for BB&T’s Tocqueville Society Leadership Dinner. From left: Zanaya Gray and Kekoa Thompkins, 11th grade Crosby Scholars at Parkland IB Magnet High School and Claire Patterson, 12th grade Crosby Scholar at West Forsyth High School. 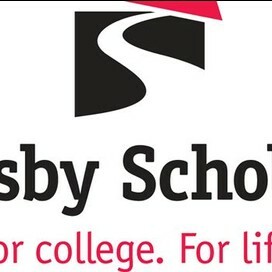 Crosby Scholars high school program partnered with Elizabeth Owens of The Princeton Review to host a PSAT Test Prep via webinar for sophomores and juniors. During the webinar Owens reviewed test strategies and practice questions that relate to the PSAT and the SAT in preparation for the PSAT/NMSQT held in schools this month. Any junior who took the test will be eligible for the National Merit Scholarship. 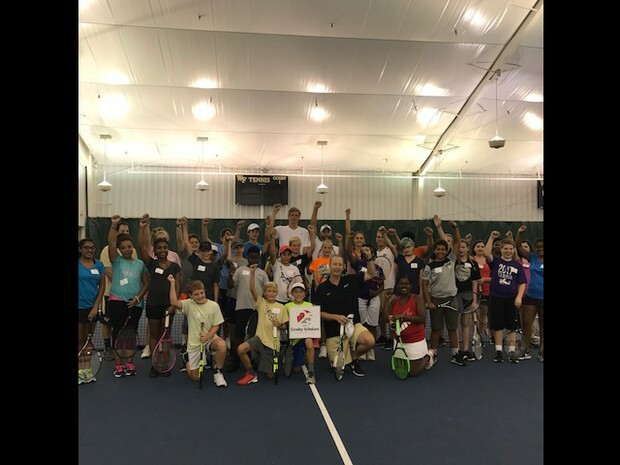 Thanks to the generous support of Reynolds American’s Right Decisions Right Now program, 40 middle school students from 12 schools participated in a tennis clinic during the Winston-Salem Open. Students spent nearly two hours with Wake Forest Women’s Tennis coach Jeff Wyshner and top ranked college tennis players Petros Chrysochos and Christian Seraphim learning about the game and honing their skills on the court. After the event, scholars and their families received tickets to the Open and food vouchers to use at the evening match. Scholarship Fund Seeks to Keep Students Engaged, "Whatever It Takes"
Elizabeth (BJ) McConnell is an expert in the field of drug abuse prevention and has been a member of the National Commission for Drug Free Schools and a consultant for the White House Conference for a Drug Free America. She had an idea to change the lives of local students and positively impact drug abuse. That idea established the framework for the Crosby Scholars Community Partnership. “Teenagers with a clear connection to their community, a sense of value and who have hope for the future are less apt to use drugs,” said McConnell. Her belief that providing young people with the opportunity to serve others coupled with a pathway to higher education to create a reduction in drug use lives on today. Today, BJ is now giving back in a different way with the development of the Whatever It Takes Scholarship for Crosby Scholars college students. 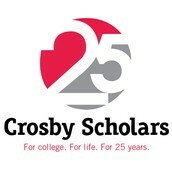 College Crosby Scholars can find the application to submit scholarship requests in the Crosby Scholars Student Portal. 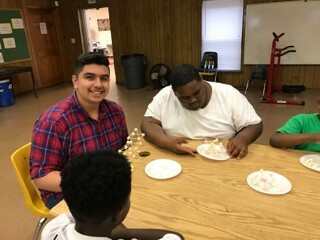 Crosby Scholars has teamed up with Big Brothers Big Sisters and the YWCA Best Choice Center to develop a mentoring program called “Crosby Bigs for Success.” The program pairs a sophomore or junior Crosby Scholar with a student in third through eighth grades. As a Crosby Scholars “big” you have the opportunity to inspire a young student to succeed in school and go to college. It is also a great opportunity for scholars to enhance communication skills, time management skills, and leadership skills, while giving back to the community. To meet the needs of our male “littles” we need 10 more male scholars! The program starts October 18 and the deadline to apply is December 22. Mentor meetings are held at the YWCA Best Choice Center, 1031 Highland Avenue, Winston-Salem on Wednesdays and Thursdays. Bigs are required to meet with their Littles once a week for an hour. Contact Amanda Latham to register at alatham@crosbyscholars.org. #GivingTuesday is a global movement that has been built by individuals, families, organizations, businesses and communities in all 50 states and in countries around the world. Millions of people have come together to support and champion causes they believe in and the communities in which they live. We have two ways for getting deals - Black Friday and Cyber Monday. On #GivingTuesday, we have a day for giving back. Every act of generosity counts, and each means even more when we give together. #GivingTuesday is a celebration of America's greatest traditions: generosity, entrepreneurialism, community. Everyone has something to give. You can give time or expertise, monetary donations large or small, or simple acts of kindness.